It’s August, you guys. This summer has flown by, and I feel like I haven’t done enough summertime riding. I plan to remedy that this weekend, but for now, here’s your weekly horse-world news roundup. Remember that adorable “Dance Pony Dance” video that everyone you know forwarded to you last year? The one with the moonwalking Shetland Pony? Apparently his appearance on British TV led to lots of inexperienced folks acquiring their own Shetlands, then abandoning them later when they realized that ponies are often challenging—and always expensive—to care for properly. And they rarely moonwalk. If there’s one thing we love here at HorseChannel.com, it’s cats and horses being adorable. If there’s another thing we love, it’s Zenyatta. So when Zenyatta’s people posted a photo of Z’s colt, Ziconic, with a barn cat, we were pretty happy. Some jerks stole saddles from a therapeutic riding program in California. That’s about as low as it gets. These were specially designed saddles used by paraplegic and quadriplegic children. The article doesn’t detail how the design differs from other saddles, but that sounds like a pretty specific thing. Hopefully that will make them easier to find. 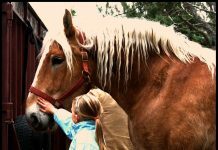 Another therapeutic riding program in California, Pegasus Rising of Rancho Santa Fe, is searching for a new home. They say their 14 horses were rescued in 2008 and now serve as therapy mounts for soldiers and veterans. They’re asking the public to help them find a temporary or permanent home. We recently published an article about equestrian home décor here on HorseChannel. Clearly we’re trendsetters, as some little upstart called Vogue just published their own. 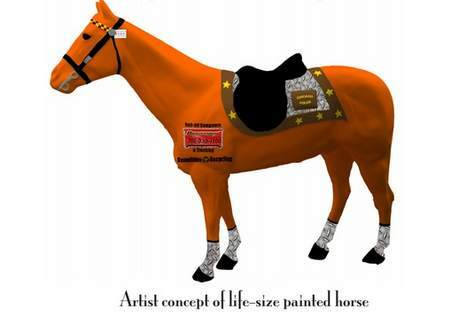 A new public art installation, Horses of Honor will put an equine presence in downtown Chicago. The Chicago Police Memorial Foundation will bring about 100 life-sized horse statues downtown this fall, each one representing an officer killed in the line of duty. Remember when there was that lawsuit in Connecticut that would have caused horses to be classified as “vicious” in that state? That was pretty much resolved earlier this year with the passage of a state law that protects horse owners and managers from certain liabilities, and clarifies that horses are not inherently vicious. That was a few months ago, but they’re still celebrating out there this week. Glad to hear it! Bad news from the Del Mar racetrack, where the 2014 meet saw seven (or eight, depending on your source) equine deaths in its first nine days. That’s unacceptable any way you look at it, but it is possibly made worse by the fact that four of those deaths occurred due to injuries sustained on the racetrack’s brand new turf track. Racing on the turf track has been suspended. Are you weighed down by all your extra money? Sure, we all are. That’s why I urge you to exchange all of it for a horse-themed Aston Martin. Because who couldn’t use that? TheStreet.com, which is a website about financial news, posted this listicle titled “7 Expenses First-Time Horse Owners Aren’t Expecting.” It starts out pretty well, with the common reminder that a free horse isn’t free, but it spirals from there. If you believe TheStreet, boarding will cost you a minimum of $600, saddles are $1,600 if you buy used ($5,000 or more for new), and your helmet will cost at least $400. Oh, also, your horse will probably live to be 45. Okay, then. like the Chicago story honoring the fallen policemen. I didn’t mean links, I meant stories! Awful about the racetrack. Love the dancing shetland!